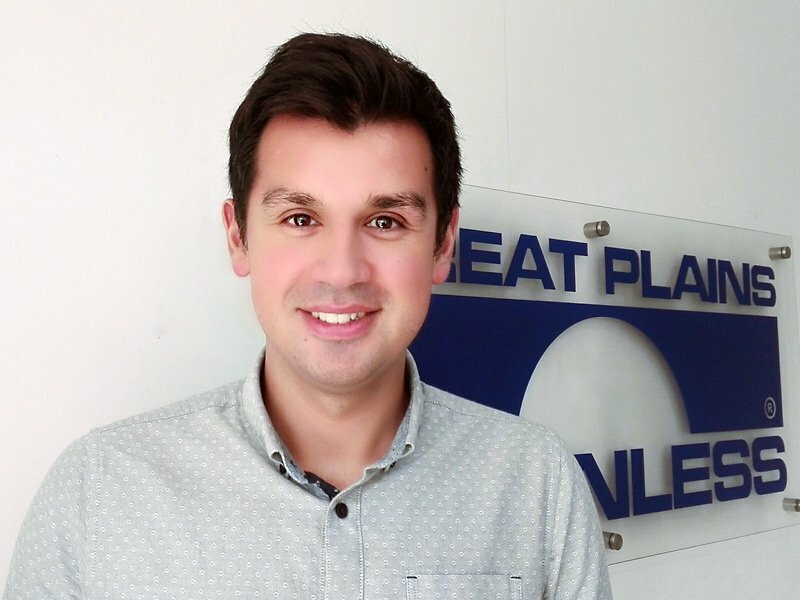 I have rejoined Great Plains Stainless from 15th June,2015 as G.M. for New Zealand office. Previously I worked for the same office from 2003 to 2013. I am a Metallurgist by qualification with over 20 years of experience in international steel business having spend most important years of my career with Great Plains Stainless. Nelson office supplies specialty stainless steel products all over Australasia region and we will continue providing high level of service to all our customers in the region. I will be interacting with customers not just on the business front but also on the technical front in detail, wherever necessary. I’m married and I have 3 children. Monica is my pride. I have experience of over 15 years in the logistics area and material control. I feel I can be a contribution to the operation. I feel very motivated and proud to be part of to the GPSS Chilean family. I’m passionate about what I do and I like to work in a team. I like wildlife photography, fishing and sharing a good barbecue. I joined the Great Plains team in 2018. I am a Production Engineer and I have specialized in the technical sales. I like to practice sports, especially soccer. I enjoy outdoor activities and share with friends and family. I am proud to belong to this excellent team and be able to provide innovative solutions to our clients to make their projects reality. I have been with GPS since 2011. I have lived here in Tulsa my entire life. I have a beautiful wife named Sara and 3 children Hope, Zach, and Jack. I enjoy sports especially TU and the St. Louis Cardinals. Am originally from India. I came to New Zealand in 2012 and completed my study here. I then joined GPS Nelson in December 2013 as Sales Executive. Hello, my name is Claudia, I joined GPS Chile at the end of December 2017. I am happily married and have two beautiful children. I love to spend time with my family. I am cheerful and optimistic because I think this is the way to resolve obstacles and challenges. I am feeling like a woman blessed by god! I started to work in Great Plains Stainless in 2005. Now I am in charge of Sales jobs in Shanghai office. Of course, Shanghai office is acting as the support office for headquarters, New Zealand, and Chile as well. I love learning about the technical aspects of the steel industry. I am proud to be an employee of Great Plains. I love my job and the people I work with. I am a self motivated individual. My free time is spent with my family and playing with my kids. I was born and raised in southern Illinois. After moving to Tulsa, I joined the GPS staff in 1989. Hi, I’m Metallurgist from Concepción, a really nice south Chilean city. I came to Santiago to develop myself and to be with my girl friend. I come from a close family. We care about each other and family is fundamental in my life. I like jogging, training, and eating healthy. I love to enjoy time with my loved ones with a delicious barbecue. I’m argentine. I came to Chile to work with Great Plains Stainless S.A. (Chilean office). I arrived to Santiago on September 2014. The best to go throw the change: I like working into team and my coworkers are easy going! I like Skiing and camping. I love trekking mountain. So, Santiago is a very interesting place to live for me. Thanks for read my profile. All the best. I joined Great Plains Stainless as manager assistant in July 2017. My job is mainly to assist general manager and support our Tulsa, Nelson and Santiago offices. I started with GPS in 2002. Before that I was a part owner of Stainless Tubular Products which sold commodity stainless pipe fittings and flanges until we sold in 1997. I have a lovely wife and two grown children. I enjoy watching and playing sports especially golf and fishing. I was born and raised in Chicago, the oldest of 12 children. I moved to Tulsa in 1975 to be with my wife’s family when we were expecting our first child. I am a long time practitioner of Transcendental Meditation (since 1971), a yoga junkie, a hiker, and a piano player. I love Notre Dame football and the “All Blacks”. I grew up in Nowata, OK. Now live in Tulsa, OK. Worked 7 yrs with Metals, Inc., a company providing stainless steel plate and bar and 13 yrs with Stainless Tubular Products, which provides stainless pipe, fittings, and flanges. I worked in outside sales with both companies. I love golf and fishing. Hi, I’m Leslie. I’m an accountant. I work at GPS Chile since april 2017, it is a challenge for me and I am proud about my labor. I am a sociable and cheerful person. I live with my husband. I love animals, we already have 3 dogs. In my free time I enjoy being with my family. I joined GPSS Tulsa in 2007. My job as the shipping coordinator, document control and accounts payable clerk offer a challenging position that I very much enjoy. I hold the office of Regent for the Owasso Chapter DAR, Daughters of the American Revolution which is a lineage-based membership service organization for women who are directly descended from a person involved in United States independence. I joined the Great Plains team in 2017. I come from a small town Oklahoma. I am a proud father and love spending time with my kids. In my spare time I enjoy working on cars, projects around the house and building things. I like being outdoors playing sports with my son, camping and hiking. As a member of the New Zealand sales team, I enjoy interacting with customers of many different backgrounds and finding out more about their specific needs so I can come up with the best possible option. I am fortunate to have been around the industry for about 10 years. I like being a part of Great Plains Stainless, and I want to help the company grow. I am father. My beautiful son Pablo was born on May 5th, 2005. He is the most important in my life. I was born and raised in Tulsa. Attended and Graduated in 2010 from the University of Oklahoma. Upon graduating I joined the Great Plains staff full-time after working summers throughout college. I enjoy playing various sports and coaching basketball. My favorite sports teams are the Oklahoma Sooners, the Oklahoma City Thunder, and the Kansas City Chiefs. I have worked for GPS since 1988 and enjoy singing karaoke. I came to New Zealand in 2014 to study. After completing my study I joined GPSS and I am really glad to join the GPSS team. After joining Great Plains Stainless in 2008 as Receptionist, I am also now responsible for Accounts Receivables and Accounts Payables in Tulsa. I am married to my husband and best friend Jesse, and my favorite hobby is researching my family genealogy. I am also an active member of two hereditary lineage service organizations – the Daughters of the American Revolution, and The Auxiliary to the Sons of Union Veterans of the Civil War. I’ve been with GPS nearly 25 years and happily married (at least I am). I enjoy the membership at the Health Zone, swim or run 4 times a week. My wife, Courtnay, & I like classical music while savoring red wine. We travel, primarily in the U.S. Spend a lot of time involved with our church, St. Pius, where Courtnay & I are on the stewardship committee.